A few days ago, while collecting his Goya award for Best New Actor in “Champions”, and claiming the “inclusion, diversity and visibility” of people with disabilities, Jesús Vidal made the 2030 Agenda visible on prime-time television. Observant viewers would wonder about the meaning of the colourful pin that he and the rest of the film crew wore on their lapel, and perhaps some recognized it: the 2030 Agenda logo. Each of the colours in the wheel represent one of United Nation’s 17 Sustainable Development Goals (SDGs). The Action Plan for the 2030 Agenda establishes that everyone in Spain should know about the SDGs by 2020. However, according to the last Centro de Investigaciones Sociológicas (CIS) barometer —which for the first time included three questions on sustainable development— only one in ten respondents had heard of the Agenda. Three years after its approval, there is still a lot of work to be done in terms of outreach and raising awareness, as society’s support is key to making the SDGs a reality. That’s why small gestures like that of the “Champions” team are more important than what they might seem. What is the degree of knowledge and involvement in the private sector? 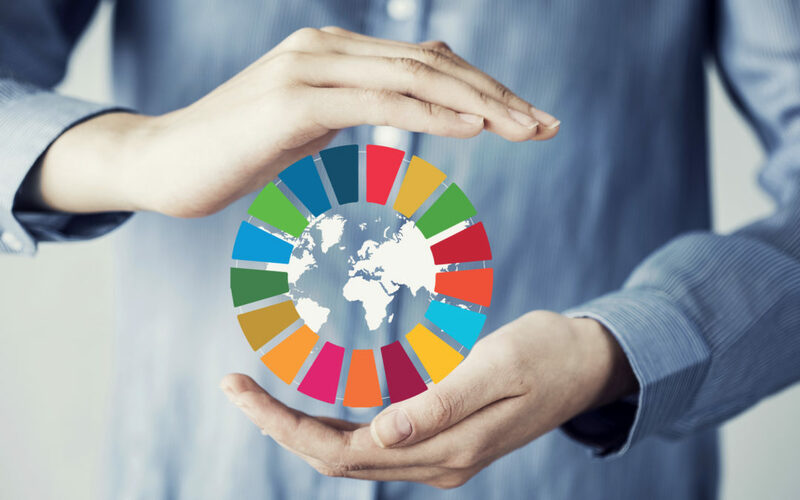 According to the report “Spanish companies before 2030 Agenda” carried out in the spring of 2018, based on responses from more than 1,300 companies, 69% of organisations are aware of the Sustainable Development Goals and, in the case of large companies, 87% of them already have measures in place to contribute to their fulfilment. The 2030 Agenda gives us an unprecedented role as development actors. For the first time in history, our involvement is specifically required to achieve the United Nations’ goals. Because of this, companies can play a major role in spreading the word. Enagás is one of the Spanish companies committed to spreading and promoting the Sustainable Development Goals. Among other actions, we have adhered to the global campaign #COMPANIES4SDGs to promote the knowledge and application of the SDGs and the 2030 Agenda through our internal and external communication channels, first among our professionals and also to society as a whole. In addition, we link the Agenda to many other initiatives. Last January, at our “Women in Networking Enagás”, aimed at promoting the leadership of women in the company, we had the honour of welcoming Cristina Gallach, the High Commissioner for 2030 Agenda in Spain, who shared her professional experience and also her vision regarding SDG 5 on gender equality. Although the first challenge of the 2030 Agenda is to make itself known, the real challenge is to move from discourse to action. Introducing the Sustainable Development Goals and transforming them into concrete actions that improve everyone’s life. “I personally ask you to take action”, was Ban Ki-moon’s message to entrepreneurs during a meeting of the Spanish Global Compact Network held in Madrid in 2015. There are a few companies that are doing this, because we have understood that it is no longer enough to have no negative impacts, but that we need to have positive impacts. That 2030 Agenda is the best way to connect with society as a whole and contribute to sustainable development, improving both our business opportunities and our reputation. The first thing towards this is to focus and prioritize, as not all SDGs have the same importance for each company. If we want to make a real contribution, and not to fall into SDG washing, or in other words, overclaim to be working towards SDGs while not actually making an impact. It is essential to select the SDGs that we can really contribute to. Because of the nature of our business and our activities, in Enagás we contribute directly to ensure access to affordable, safe and sustainable energy (SDG 7) and to facilitate innovation, and the development of industry and infrastructure (SDG 9). In addition, our corporate management and policies contribute to gender equality (SDG 5), economic growth and the creation of employment and decent work (SDG 8), combating climate change (SDG 13), and the conservation of life on land (SDG 15). And dialogue and collaboration with our stakeholders enables us to establish partnerships for the creation of shared value (ODS 17). For each of them, we have established indicators that allow us to measure progress.